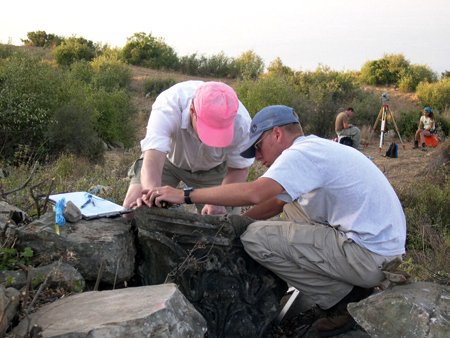 In 2005 season the project began to document the temple's remains by surveying every block in situ with a total station. In that preliminary study season the team recorded over 270 architectural blocks, either fragmentary or whole, to create an accurate plan of the blocks and to document their findspots. During this study it was also possible to determine the basic form of the temple: broad stairs at the south lead to a tetrastyle prostyle porch. There was apparently a single chamber in the interior. The temple was ornately decorated with Corinthian capitals, and relief mouldings of floral, geometric and mythological designs were carved on the porch's architrave soffits. Even in its ruinous state, it is clear that it once was an imposing and handsome temple. Identification of the dedicatee of the temple is not known. The pediment block that once stood atop the entryway, however, is preserved and shows the bust of a male in the manner of the god Apollo flanked by winged Victories. This type of iconographic formula suggests an Imperial personage, but which Roman emperor is represented still remains open to question. Nevertheless, the details of carving of the bust and other sculptural elements suggest that the temple likely belongs to the first half of the third century A.D.